Each year our spring and summer training season culminates with a fun and family friendly race. This race is the big season finale for Twin Cities franchises, and a destination event for our runners nationally! All women are welcome to join us! This event is fun for all and is not exclusive to members. New in 2019: Certified Race Courses and Timing by Mtec! Your race entry fee includes a soft performance blend tee, virtual event bag, personalized bib, finisher’s medal and charity contribution. Certified Courses for the 5k and 10k! **50% discount after 3 kids. Kids get tech shirts! We share laughter and tears and a season full of memories at this can’t-miss event. We will celebrate our accomplishment and our season victories! You won’t want to miss this evening of fabulous food and speakers, prize drawings and more. Scroll down to view general race information. You can also check out our frequently asked questions page. Kiddie Dash for Ages 7 and under, untimed and done in waves; recommended for those unable to complete a half mile and will be a stretch of approximately 50-200 yards (age-dependent) before the finish line. ​Choose either event on race day. Children registered in the chip-timed 5k will also be able to switch to the half mile without any transfer fees. A portion of proceeds will go to our favorite local charity with worldwide impact, Feed My Starving Children! Learn more at www.fmsc.org. Proceeds will also go to other charity organizations helping to support our event with volunteers, as applicable. Parking is on site and requires a $7 parking pass which you must purchase at the time of registration, if you do not already have an annual parking pass for Washington, Anoka or Carver county parks. This is done via the honor system; we do not provide a physical parking pass with the purchase. For more detailed parking information, check out our FAQ page. The Moms on the Run 5K/10K, Kiddie Dash and Half-Mile Kids' Run will be held rain or shine. However, for safety reasons, we will cancel the events due to lightning or other severe weather, and unfortunately, we cannot provide refunds due to costs already incurred. Take care to dress for the weather conditions. 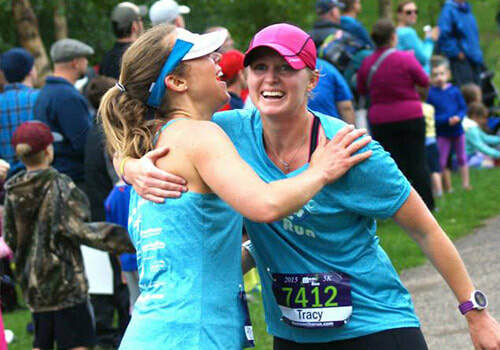 Moms on the Run offers a performance blend tee, virtual event bag, personalized bib, and finisher’s medal for all 5K and 10K adult participants! Kids 12 and under participating in the 5K, Kiddie Dash or Half-Mile Kids’ Run will receive tech t-shirts, virtual event bag, personalized bib and finisher's ribbon (or medals for 5k). 1st place prizes and 1st-3rd place certificates will be awarded in 7 age categories for each event. Details will be updated closer to the race. There will be no refunds for any reason. Changing between events will be available until August 17 as space allows for a $10 administrative fee. New this year, transfers will be allowed for a $15 administrative fee. Contact Angela@momsontherun.com by 8/20 to arrange a transfer. Offering your bib to an unregistered participant is not allowed, and not only due to legal and liability concerns. Making these changes without undergoing the transfer process affects age category results for all participants, and in the past has resulted in rightful winners not receiving their earned prize.